What Is A Good Facial Moisturizer For Rosacea? Choosing a good quality facial moisturizer for rosacea is a number one step if you want to calm the appearance of reactive redness and minimize the risk of skin irritation. Did you know that one of the factors that trigger rosacea is certain skincare products and cosmetics containing synthetic chemical irritants? The above has been proven by surveys showing a very high percentage of people being affected by inappropriate chemical products. Other factors which trigger rosacea are sun exposure, wind, heavy exercise, alcohol consumption, spicy foods and others. So, what should a moisturizer for Rosacea contain in order to be safe and effective? The answer is organically certified natural ingredients which have been proven by researches that do not irritate sensitive skin and have calming and restorative properties. Meet Pai Organic Skin Care! Pai skincare is a company which specializes in top quality organic products for all kinds of sensitive skin. Lately ( September 2014) Pai organics have launched a new super concentrated product for rosacea, prone to redness and hypersensitve skin which is a serum. For more information on this, you can read my Pai Sea Aster & Wild Oat Instant Calm Redness Serum Review. Their wide range of products offers very effective solutions based on the type of skin like hypersensitive, oily skin and combination, dry, dehydrated, mature skin as well as different conditions of sensitive skin like rosacea, eczema, uricaria, psoriasis, contact dermatitis and adult acne. So, they have products focusing on all skin types and different issues of sensitive skin. What is Pai’s Facial Moisturizer for Rosacea All About? All of the ingredients in Pai’s Chamomile & Rosehip Calming Cream are carefully chosen because of their ability to sooth and protect prone to rosacea skin. According to the company, Pai has its own R&D lab and manufacturing facility with a team of professional chemists being in constant search of natural-active components to give their products high quality and performance features. Pai’s soothing moisturizer for rosacea is rich in antioxidants and Omegas 3, 6, 7 & 9 as well as azulene, a natural anti inflammatory, which cools and calms the flushing. Organic chamomile and rosehip work in perfect synergy to protect and soothe sensitive skin. Moreover, Pai’s face moisturizer is free from alcohol which can trigger Rosacea as well as chemical irritants like artificial fragrances, propylene glycol, phenoxyethanol and parabens. If you want to check the purity of Pai’s organic ingredients yourself, you can check their informative and understanding guide on Pai’s official site. Pai skincare also offers other skincare products specifically for rosacea like toner, facial cleanser for rosacea, eye cream and an excellent revitalizing rosehip oil serum. All their products are certified organic by the Soil Association and are suitable for vegans. 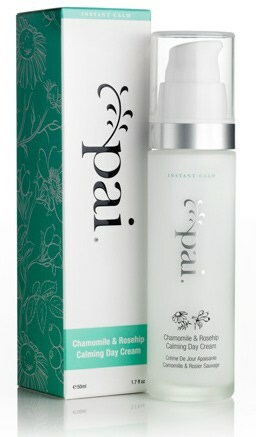 Finally keep in mind that if you decide to buy Pai Chamomile & Rosehip Calming Cream, the company offers you a 30 day money back guarantee if in 30 days you don’t see any improvement in your skin. So, you can return your purchase for a full refund or exchange what you bought for another product. If you want to learn more about Pai’s facial moisturizer for Rosacea, on Pai official site you can read people’s reviews as well as get informed about how to order samples in case you want to be more certain about your choice.